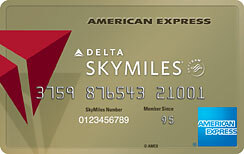 Do you have a Delta Airlines American Express Card? If so, did you know that you can check bags for FREE if you do? It’s called First Checked Bag FREE. The FREE benefit applies to up to 9 people traveling in the eligible Cardmember’s reservation for their first Checked bag! That could be a HUGE savings if you travel frequently. On a round trip each person would pay $50 for their checked bags. So in reality you could save $450 for a flight with nine people! HUGE FREE Savings. You don’t have to pay for your ticket using your Delta SkyMiles Credit Card to receive the First Checked Bag FREE benefit. Your family of four travels twice a year on Delta and checks baggage. Each flight would cost you $200 in baggage fees. The total for both flights would be $400, in baggage fees alone. The annual fee is $95 (FREE for the first year). So, $400 – $95 = $305.00 FREE to spend on your vacation! SWEET! ► FREE Priority Boarding – great perk if you have kids!